In modern scanning systems like the ones Belton Veterinary Clinic has on-site and uses on our canine patients, the sound beam sweeps through the body many times per second. This produces a dynamic, real-time image that changes as the dog ultrasound device moves across a dog's body. We can use the results of an ultrasound to determine what is ailing your dog, and to devise the most effective treatment protocol. We do not perform this service at Belton Veterinary Clinic. This section is for information only. A dog MRI is not used as regularly as an x-ray or ultrasound because the equipment is very expensive, very large, and requires specially trained technicians to operate. We refer our patients to another facility that is equipped with a MRI unit. Just like MRI equipment, CT scan equipment is very expensive, large and requires trained technicians to operate. We refer our patients to another facility that is equipped with a CT unit. 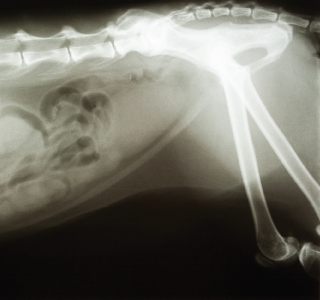 If you are concerned that your dog might be injured or experiencing internal problems, or to discuss how canine radiographs can benefit him or her, please contact us to have your dog seen by one of our veterinarians today.